According to kurnik blog, shogi has been added to the line of its online realtime games. Kurnik.org is a Polish site. I hope this will increase the number of shogi players especially in Poland. In addition, it supports multilanguages so I hope it will serve potential shogi players in various countries who are not so good at English outside Japan. Here is the information about how to choose symbolic(westernized) or kanji pieces. After logging in, you click to SHOGI to the entry screen of shogi. Then you can enter any room of the choice. After that, you will see the following screen. Click the button of preferences on the upper right. Then you will have a smaller screen. Delete checkmark if you like to use Kanji pieces and press ok. Kurnik.org shows symbolic(westernized) pieces as a default. I play there from time to time under the nickname of takodori. I will be glad if you play a game with me there. Hi, Takodori. 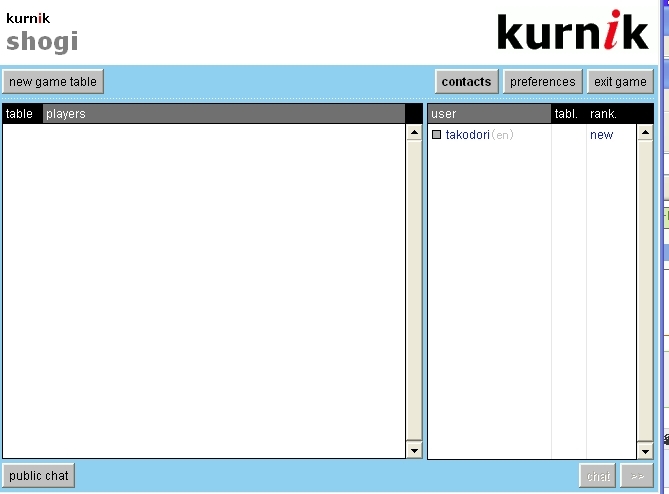 I also registered Kurnik. I may join someday for public tornament I hope. Hi, Fukuhara-san, Thanks for your comment. Looking forward to seeing you there.